In most coastal areas of California, avocados are grown in hilly areas up against wildlands. This is done for various reasons, often for improved frost control amongst other reasons. It also puts them near areas that are home to bobcats, bears, mountain lions, coyotes and increasingly with the Invasive Shot Hole Borer that carries Fusarium Dieback that can affect avocados. 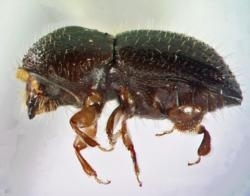 The Santa Monica Mountains Resource Conservation District which abuts and includes many orchards has been monitoring for the ISHB borer along with two other borers that affect coast live oak. These studies are focused on the riparian and wildlands areas, but will give some idea of the pest movement towards orchards This is a wonderful example of the collaboration of volunteers and various organizations involved in the better understanding and management of this and other invasive pests. Click on the link RCD Santa Monica Mountains below to read the report.